"Celebrity" tomato was the All-American Selection winner in 1998 and continues as a garden staple. Like other tomatoes, this variety (Solanum lycopersicum "Celebrity") is a tender perennial typically grown as an annual vegetable. They are hardy in U.S. Department of Agriculture plant hardiness zones 10 through 11. "Celebrity" tomatoes are a standard variety known for having a good flavor when eaten fresh. It resists several common tomato diseases, including verticillium wilt, fusarium wilts and tobacco mosaic virus. They also resist nematodes. 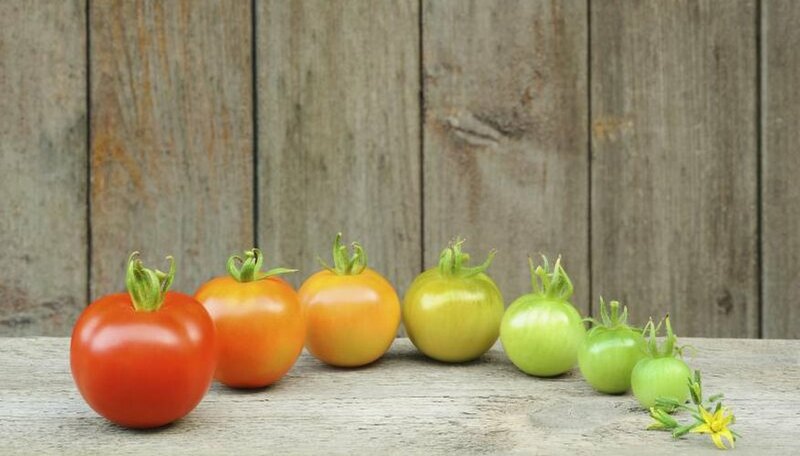 The standard "Celebrity" tomato can grow 5 feet tall unless you pinch back the plants. It takes 70 to 75 days from planting until the first fruits are produced. The "Bush Celebrity" variety is more compact, only growing 15 inches tall. It requires 67 days from planting to harvest. The fruits for both varieties weigh 7 to 10 ounces each. Tomatoes need full sun to thrive and moist, well-drained soils rich in organic matter. To amend soil for tomatoes, spread a layer of well-composed organic matter over the soil and work it in to a depth of 6 to 8 inches before planting in the spring. If you're using a plant-based compost, apply a 2- to 3-inch layer. If you're using a manure-based compost, apply a 1-inch layer. Plant tomatoes outside after all danger of frost has passed and nighttime temperatures are consistently above 32 degrees Fahrenheit. Daytime temperatures above 60 degrees are best, and days that fall below 55 degrees will stunt plant growth. Space "Bush Celebrity" tomatoes 24 inches apart, and standard "Celebrity" tomatoes 36 inches apart. This allows for plenty of air circulation around the plants and reduces the risk of disease. Space rows 4 to 5 feet apart. Remove tomato plants from their containers and gently loosen the root ball. If the plants are compact and bushy, plant them just deep enough that the garden soil covers the top of the root ball. For leggy plants with a long, leafless stem, dig a shallow trench and lay the plant on a 30-degree angle to bury the stem and roots. Leave the top 5 to 6 inches of plant sticking up out of the ground. Water the tomato plants thoroughly once they're in the ground. Avoid overhead watering as much as possible, since water splashing on the leaves can encourage disease. Watering in the morning will give the plants time to dry before nightfall while decreasing water loss to evaporation. Mature tomatoes require 1 to 2 inches of water per week. "Bush Celebrity" tomatoes do not require staking. For "Celebrity" tomatoes, some type of support is recommended. Wire tomato cages that measure 2 feet in diameter and 4 to 5 feet tall are a good option. Place the cages over the young plants after planting. At planting time, apply a low-nitrogen fertilizer with an N-P-K ratio of 8-32-16 or 6-24-24 at a rate of 1 pound per 100 square feet. Work this fertilizer into the top 6 inches of soil. If tomatoes run out of nitrogen during the growing season, the leaves will start to turn yellow. When you notice yellowing leaves at the base of the plants, start applying a water-soluble fertilizer every two to four weeks according to label directions. For example, when using an all-purpose plant food with an N-P-K ratio 24-8-16, mix at a rate of 1 tablespoon per 1 gallon of water. A gallon feeds 10 square feet of garden.